Instead of installing wallpaper, a few years ago San Francisco artist Tim Balon painted a pattern in his hallway. Soon, friends were asking him to decorate their walls too. Trained as an architect and deeply influenced by California design from the 1950s and ’60s, Tim aims for a balance between simplicity and chaos. If it appeals to you too, take these tips from Tim. First, measure and draw a grid on your wall, then cut pieces of the template from a piece of chipboard. Use those pieces as guides when drawing the pattern on the wall. Start painting with the color that will cover the largest area (in the Cool pattern shown on the opposite page, for instance, Tim started with Ocean Air). Tim’s favorite brand of painter’s tape is FrogTape. When the paint hits it, he says, it binds to the wall, ensuring a cleaner line. Just be sure to remove the tape before the paint dries completely. 1. Cool. Muted colors in the same family make the pattern’s geometry the star. 2. Warm. Subtle and sophisticated, these colors mimic a desert sky at sunset. 3. Metallic. Get a reflective surface without the disco-ball effect. 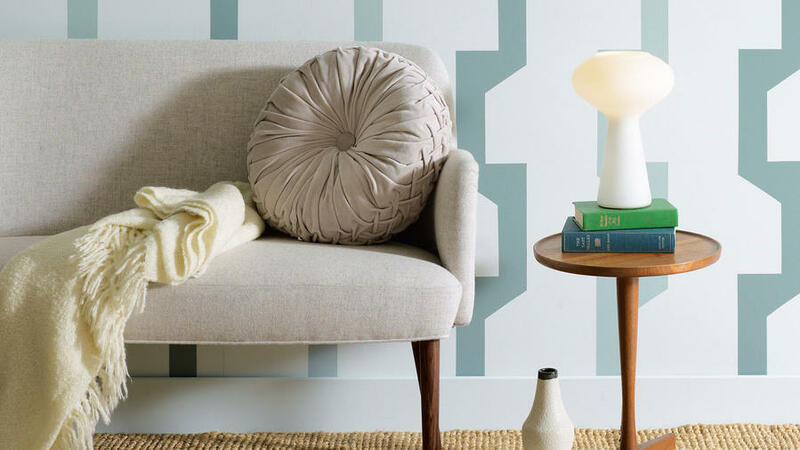 Renters, take note: Works well on white walls. 4. Vibrant. For the bold—and the patient! Fantastic on a floor or in a small bathroom. Download the template and get started!